This brand of face paint is another variation on TAG and Diamond FX. Easy to apply and needs very little water. Quite a creamy paint. Can be applied with a brush or damp sponge. Make sure that you do not overload with water otherwise the paint will go gloopy. Calcium carbonate, Paraffin wax, Petrolatum, Dextrin, Glycerin, Stearyl alcohol, Water, Acacia senegal gum, Sodium benzoate, Perfum musk. May contain: Titanium dioxide (CI77891), Iron oxide (CI77491), D&C red 7 (CI15850:1) D&C red 6 (CI15850, D&C black 2 (CI77266) FD&C yellow 5 (CI19140), FD&C blue 2 (CI74160), FD&C white 16 (CI77163) and Fluorescent pigments. Click here for a material safety data sheet on PartyXplosion paints. It is just the perfect red for spiderman designs. 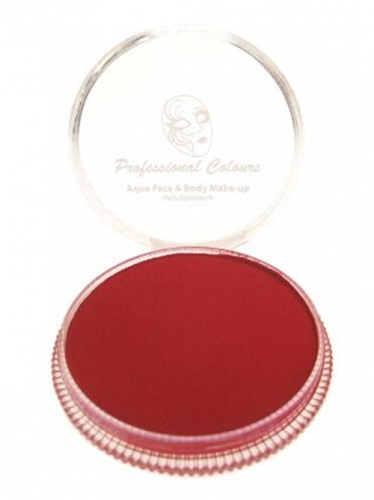 Coverage is opaque and in very bold colour, however washes off easily without any stains.